There are few things I enjoy as much as a true tale of shame and embarrassment told by a gifted spinner of yarns. Even better if the story in question doesn't have me as its protagonist, though this isn't compulsory. In fact, many's the time I've found myself in some ridiculous predicament only to think "ah well, at least this'll make a good story". Such was the basis, I suspect, of Robin Robertson's 2003 anthology Mortification: Writers’ Stories of their Public Shame, a book that grew out of his work in publishing that required him to travel the country talking with writers. He discovered both a rich vein of mortifying stories, and certain one-upmanship in storytelling (I have certainly experienced this myself, and the phrase "you think that's bad..." is usually in the mix). 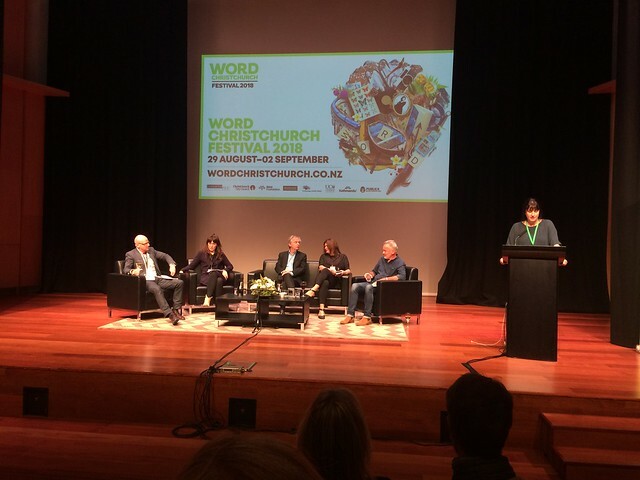 In this WORD Christchurch Festival session Robertson revived Mortification in a live format. It's one thing writing an embarrassing anecdote down for publication - is it better or worse to have to read it in front of an audience? It's hard to know if the writers involved are Robertson's victims, or simply masochists but they all acquitted themselves with dignity... or at least as much as could reasonably be mustered. Which in the case of Jarrod Gilbert (whom we'll get to later) wasn't much. I've become really inured to the kind of embarrassment that really f***s up other people. Apparently if you're mortified often enough it sort of stops bothering you. Paula Morris, respected writer and mainstay of the New Zealand literary scene, might beg to differ. She offered up, not a single, horrifying tale, but a thousand small humiliations instead, ranging from critical underwear failure at an operatic recital to childhood trauma via angry goat. Shorts that inexplicably opened during a speech. The shame of being at a signing table where noone wants your signature. Repeatedly being mistaken for poet Paula Green. And most significantly, her failed attempt at guiding a blind woman and her dog between London tube stations. It was a hard act to follow Welsh, but Morris can hold her head up high... in shame. Steve Braunias told a clever and complex tale set during a period of unemployment, when his lodgings were less than salubrious. Braunias is a great storyteller - you don't quite see the punchline coming, even as the clues of it are laid out carefully as he goes along, the slightly dopey loser persona he adopts adding to the comedic effect. The audience were in stitches. And yet... to me it felt very much like carefully crafted humorous story... that didn't really happen. Which is fine as far as humorous stories go, but there's something about the vulnerability of a true story, told by the person it happened to that is far more affecting. Being clever isn't the point. Being shamefacedly honest is. Call me cynical, if you will, but I struggle to believe that Steve Braunias did, in fact, give Helen Clark fleas at a classical guitar concert. On the other hand, I didn't have any trouble believing that Megan Dunn (author of Tinderbox) attended a mermaid class in Florida, nor that she was not particularly gifted in the art of mermaiding. Synchronised swimmers aside, who would be? One of the reasons I believe this story is that Megan Dunn is currently writing a nonfiction book about mermaids (the pretend adult woman kind, not the mythical creature kind - no, I didn't know there were different kinds either) and because if you're going to invent a story that involves shimmying into a lycra mermaid "tail" it's not going to be orange. Still, I felt like the actual mortification levels in this story were comparatively low because "failing to be sufficiently mermaidy" just isn't that embarrassing. Fascinating, yes. A topic you'd rather didn't come up round the Christmas dinner table? Not so much. Finally, Dr. Jarrod Gilbert, award-winning author, University of Canterbury lecturer and, according to Braunias, "the thinking man's drinking man" shared an inspiring* tale of bloody-minded determination vs good sense, reason and dignity (but who needs them anyway?). As is often the case with tales of humiliation it began with guys egging each other on - a friend simply said that Gilbert couldn't run a marathon in 3.5 hours. So rather than let his friend be right about something, Gilbert endeavoured to do just that. What resulted was hallucinatory levels of physical and mental pain, and a impromptu bowel movement - Gilbert walking to the centre of the stage and adopting a crouching posture so as to paint a more vivid image in our minds (that wasn't really necessary). This took place on the Sumner Causeway, or as Gilbert described it, "possibly the most exposed piece of geography on Earth". But there's a happy ending! Gilbert achieved his marathon goal (thereby disproving his friend's assertion) with less than 2 minutes to spare... admitting "it’s very difficult for me to describe just how little satisfaction that gave me". It's almost as if a person shouldn't undertake a massively time-consuming and difficult task just to prove a point that wasn't in great need of being made. Though saying that, it's probably not in the spirit of the evening to try and extract a moral from any of these stories. Then again, "beware inopportune Glaswegians" does have a certain ring to it.